I know that might sound like an odd combination, but to me, it actually makes perfect sense. One of the worst parts parts (for me) about chemo for breast cancer is that you know you’re going to lose your hair. I remember trying to be so brave about it, but the truth was always that, I was scared shitless that it would not grow back. I have armed myself with wigs and scarves, and I knew I was never going to be brave enough to be “oh Naturelle” I so admire many of my friends that have posted pictures of themselves bald. I have never been so brave. I do have the picture, (I let Hailey take one picture, and one picture only, and she knows that picture is never to be seen unless I say so) and maybe next year I will post it, but right now, no, I just can’t. People tell me, bald is beautiful. Like my scars, yes, they are my victory scars. But there are days, , that I look in the mirror, and just want to vomit. Two scars that are my reminders of what they took out of my body, one scar a reminder what they put in my body (my port) to make sure that I could take the drugs that would ensure I didn’t have to get anything else taken out. My hair, it’s starting to peak through, but I’ll be covering my head for a long time. Now from radiation, one breast is much much darker and sensitive than the other. That will go away. The fatigue will eventually go away. Eventually my hair will grow back, but the scars will always be there. A reminder that this happened. I can never take life for granted again, innocence lost. My hair is starting to grow back, slowly. I actually have to shave it back a little as the first growth is chemo damaged, and radiation has slowed down the growth, so I will do that soon. Actually Richard will. He is much better at that than I. He has had lots of practice! The benefits of being married to a bald man 🙂 It’s going to be a long time before, I will “uncloak” my head. I miss running. The last time I really ran was in February before my surgery. I got scared. Scared I would fall and hurt myself. I was never told I had to stop, but when I was told that I had to have chemo, and that chemo, and Herceptin affects the heart, it kind of freaked me out. Plus I was tired a lot. So I did lots of walking. Now with radiation, putting on a run bra, and the friction of running, well let’s just say….it’s not a pretty picture. And what would I wear on my head! I know, these seem like excuses, but cancer plays major head games on you. 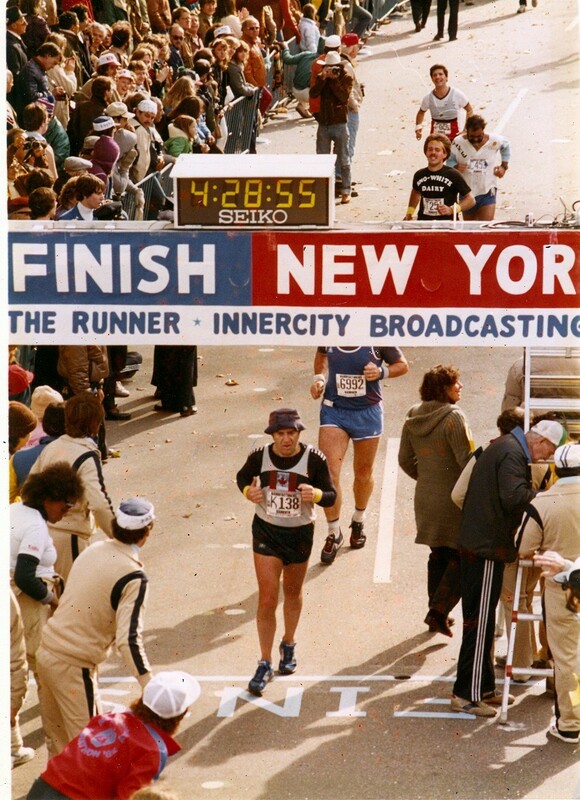 Today is the New York Marathon. I had entry to run it today, but cancer took that away, and I had to defer. I have run it before in 2009. 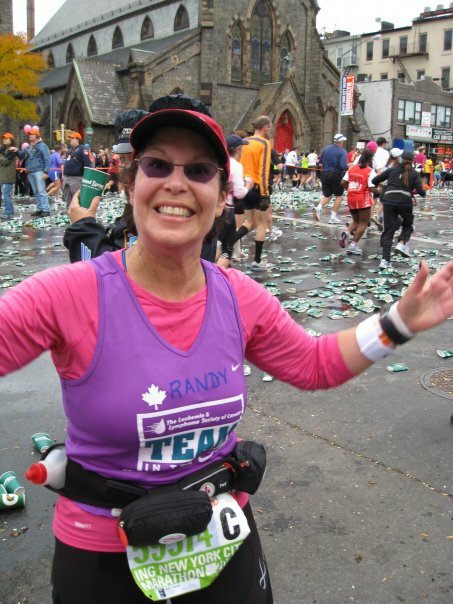 I know I have had a different type of marathon to deal with this year, and that’s very true. But it’s not the same. Yesterday was my Dad’s birthday. He would have been either 82 or 83. Happy Birthday Daddy!! I posted the picture below of him on my Facebook page. Thank you for all your wonderful comments! They are so appreciated. My Dad was a runner, and he was my inspiration to run, as was my Mom. I thought they were both nuts for running marathons and half marathons. It wasn’t till many years after my Dad passed away that I took up running, and realized they were nuts! and how incredible the feeling of running was. I miss my Dad everyday, and there is not a day that goes by that I don’t think about him. When I ran the NY marathon in 2009, I ran it for my Dad. You see when he got sick, he had entry to run NY for his 5th time, but he never got to run that race. NY was my 5th marathon, and I completed his journey. Richard, and my brothers and sister in law’s came with me to cheer me on and share the journey, and my Mom was with me via telephone. So that’s my Dad, crossing the NY finish line, and that’s me around the 10 mile mark in 2009. Here’s my plan. I will start running again, but probably not till the spring. I still have a fear of sliding on the ice in the dark, and all I need is to break my leg…NOT. I do have a treadmill, so maybe I will start there to be ready for the spring. By spring, my hair will a grown a little more. It grows about a half inch a month, although radiation does slow that down. So, I will find some great run head covers, and get back out there. I miss the social part of the run! After all….what’s said on the run…stays on the run! Kind of like Vegas! I have 8 more radiation sessions to go. I’ve been working through all of it, as I did through my chemo. I am starting to feel the fatigue. On Friday I came home, went to bed at 7, and didn’t come downstairs till 11 yesterday morning. I’m guessing I was tired 😉 I’m told I will start to feel like “me” again in January. I’ve said it before, I’m not sure what me is anymore. As I re-read all this, I know I sound down, and I really don’t mean to. But I promised, I would keep my blog real, and I guess “down” is how I’m feeling. I share the ups and the downs. I’m hoping for lots more “ups” as I get away from the everyday treatment. It’s hard for my family and for those around me to really understand what’s going on inside me. I look good on the outside. I tell people I’m fine, doing well. Hopefully soon, I really will be! This entry was tagged breast cancer, cancer fatigue, fears about breast cancer, hair loss & chemo, New York Marathon, running. P.S. I am still waiting for the call to begin radiation. .
Hey Babe, when you are ready to run, baldy or not, we are here for you. Me thinks a good ol’ baseball cap would work wonders. Also, when you start running again, you won’t care what anyone else thinks of your hair or lack thereof, because you will be running! I can so relate. Good days and bad days, positive days and negative days, feelings of happiness and of sadness, feelings of gratitude and feelings of self pity. They are all part of the cancer journey. Allow them, accept and embrace them. Randy, the fact that you are being so honest in this blog is remarkable. You never need to make excuses or give anyone any reasons. You will run again, when you are ready.